Our major areas of study include history and geography as well as government and leadership, global studies, and law. Our social studies program integrates these diverse areas into the context of our current society. The humanities curriculum develops students’ critical thinking, writing, and communications skills. The aim is to cultivate their ability to articulate, modify, and defend a position by learning and analyzing a defined body of content. The development of learning skills and attitudes plays as important a role in the education of each student as the acquisition of content. The knowledge explosion and the increasingly sophisticated means to access information make it vital that we equip our students with the aptitudes to evaluate a bewildering array of choices. Students are challenged with a varied set of learning activities including granular small group and full class discussions, expansive research, achievement tests oral presentations, and debates. 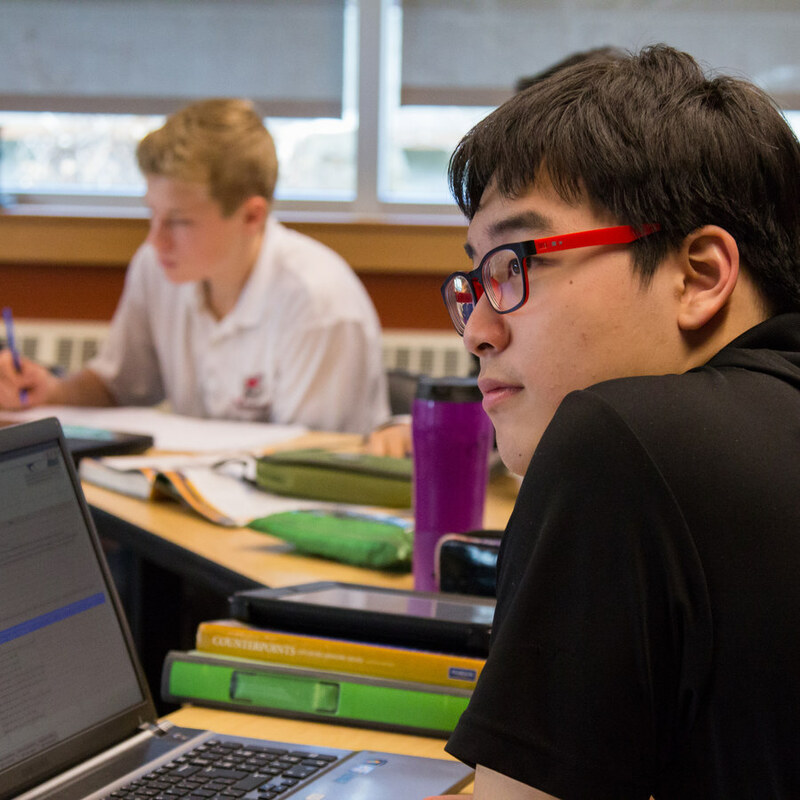 As a Canadian boarding school each student will be introduced to aspects of Canada's history and geography in Grades 9 through 11. The country’s unique multi-cultural identity, economy and resources are reflected through an examination of Canada's heritage, First Nations people, the influence of the United States, and our future as a global trading partner. We also have a mandate to track modern nature of current events and to remind students of the global issues beyond the school gates. This course provides an examination of social justice issues at the global and national level, and challenges students to assess how these issues are interconnected. Through developing an understanding of the causes and impacts of social injustices, it is the hope that students will draw conclusions on the extent to which advocates, organizations and law makers can promote and protect human rights. Themes include values, morality and ethics in light of social service, and personal and social responsibility. Global topics include education of girls in Afghanistan, Israel and Palestine relations, and decriminalization of homosexuals in places such as India. National topics include people with disabilities, LGBTQ, and ecological justice. The United Nations resolutions and declarations, as well as the Canadian Charter of Rights and Freedoms will also be examined. For the purpose of complementing the Physical Geography 12 course, this non-AP option provides students with the opportunity to recognize demographic patterns, identify factors that cause urbanization and its influence on the environment, and assess the influence of industrialization on settlements and resources. Through analyzing data from a variety of sources, students will develop an understanding of how human activities alter their surrounding landscapes, and how settlement patterns are influenced by physical features and natural resources. This senior level course will allow the students to be immersed into the theory and practical aspects of Entrepreneurship. Entrepreneurship in the last two decades has been looked at and considered a salve for many of the economic ailments of our times. In addition to extensive study of theory, the students will participate in “Project Innovation “ which will challenge them to run a business for a brief period with minimal funding, experience or help. The students will face some very interesting challenges and situations which will make the theory presented later more meaningful. For a large part of the year the students will be required to create a venture from scratch and then implement that venture during the annual Brentwood Regatta in April. Students invest their own money and reap the benefits of their diligence and creativity. This project gives all of the students’ practical experience in many of the problems and challenges the entrepreneur faces each and every day. The AP Macroeconomics course provides students with a thorough understanding of the principles of economics and how economists use those principles to examine aggregate economic behavior. Students learn how the measures of economic performance, such as gross domestic product (GDP), inflation, and unemployment are constructed and how to apply them to evaluate the macroeconomic conditions of an economy. The course recognizes the global nature of economics and provides ample opportunities to examine the impact of international trade and finance on national economies. Various economic schools of thought are introduced as students consider solutions to economic problems. Students are discouraged from taking AP Macroeconomics and AP Microeconomics in the same year; a suggested sequence to the courses for students who are interested in both courses would be AP Macroeconomics in Grade 11, then AP Microeconomics in Grade 12. As the concepts macroeconomics are important for a further understanding of the world of politics and global relations, even those students not necessarily focused on business would be well-served in taking the course, in either year. Students will look at many aspects of accounting, but of equal importance will be their exposure to the discipline required in accounting and the ethical implications in the overall business and economic community. Some of the key areas of study will be include basic accounting principles and the accounting cycle. Students will be expected to distinguish the basic forms of business ownership, be aware of the various career opportunities and accounting designations and become familiar with the use of computer technology in the accounting process and report generation. Students also study internal control systems in the management of a business, the analysis of a financial system of a business by reviewing financial statements and develop an understanding of the stock market activity and terminology. According to the US College Board, “AP Microeconomics focuses on the principles of economics that apply to the functions of individual decision-makers, both consumers and producers, within the economic system. AP Macroeconomics, conversely, focuses on the principles that apply to an economic system as a whole.” This course covers topics such as basic economic concepts, the nature and functions of product markets, supply and demand and theory of consumer choice. Production and costs, firm behavior and market structure are also presented. Students will then develop an understanding of factor markets, derived factor demand and marginal revenue product. Lastly, hiring decisions in the markets for labor and capital and market distribution of income, market failure and the role of government are all examined. Although it is not required, students who are interested in both economics courses are encouraged to have taken AP Macroeconomics 12 (in Grade 11) prior to AP Microeconomics 12. This course looks at the general theory of Marketing, Entrepreneurship and Accounting. The Marketing mix is explored in detail after the students are exposed to some behavioural psychology and how it impacts our decision making processes. The sales process is looked at in some detail and students are asked to enter the marketplace and sell advertising for the annual Brentwood Regatta Souvenir program. Opportunities for initiating other entrepreneurial endeavours are explored, characteristics of the global market are defined and personal networking is encouraged. Rudimentary market analysis is conducted and ways to control and manage cash flow and tracking expenses are presented as part of an introduction to accounting. Business registration and taxation, cash flow processes, and sources of funding and support for a venture are also introduced. Students are encouraged to enroll in this course in preparation for senior business courses such as Entrepreneurship 12, Financial Accounting 12, AP Microeconomics, and AP Macroeconomics. According to the AP College Board, by enrolling in this course, “students develop and use the same skills, practices, and methods employed by historians: analyzing primary and secondary sources; developing historical arguments; making historical comparisons; and utilizing reasoning about contextualization, causation, and continuity and change over time.” By dividing United States history, from 1491 to present day, into nine historical periods and seven themes, students will develop an understanding of early exploration, colonialism and settlement. Then, embark on topics such as power and politics, national identity, culture and society, geography and global interactions. Students are encouraged to have already taken Social Studies 11 or another senior history course such as 20th Century World History 12 in preparation for this advanced placement course. Students will evaluate the origins, purpose and impacts of political systems and ideologies in Canada and around the world. Issues at the regional, national and international levels are explored and students will assess relationships between these issues and policy formation. Power structures, independence movements, elections and electoral systems, the role of mass media, Indigenous governance, and international governance will also be pursued. Students are encouraged to enroll in Political Studies 12 as a prerequisite to AP Comparative Government and Politics 12. This course is designed to engage students in their society. We look at all things culture. Specifically, how culture is formed, developed, organized, manifested, and adapts to conflict. At points, students will focus on specific areas as a class, and during more individualized stretches, students will explore areas of their own personal interest. Additionally, we will be inviting guests to join the class and share their perspectives or expertise in specific areas. In a globalized world, it is important that individuals explore different ways of knowing and understanding the world; this course will start that journey. Students will develop their judgement and reasoning skills by assessing the consequences of technological change, people, and events. They will understand how these consequences shaped global change and historical significance. Topics presented in this course include: the rise and rule of authoritarian regimes, civil wars, independence movements, and revolutions. Human rights movements, including those of Indigenous peoples, religious, ethnic, and/or cultural conflicts, including genocide and global conflicts (including World War I, World War II, and the Cold War) are also examined. The role of nationalism is studied through the presentation of migrations, movements, collective security, and territorial boundary changes. Students are encouraged to enroll in 20th Century World History 12 as a prerequisite to AP United States History 12. In this course students explore various aspects of Indigenous culture, values, traditions, history, languages and land. Students will examine the social, cultural, economic and political impacts of colonialism and cultural genocide, and discuss the movement towards decolonization. Students have the opportunity to learn course content by means of storytelling, analyzing case studies, and interpreting literature by Indigenous authors. Guest speakers and Indigenous artists will join our class frequently to further explain the significance of cultural expression. Experiential learning opportunities will be offered throughout the year, including a field trip to explore the culture of the Coast Salish people and legacy of the Residential School system. Having grown up in the mountains of eastern British Columbia without much television to speak of, Mr. Robinson is drawn to the great outdoors at every opportunity. After completing high school he ventured to the University of Calgary to complete several degrees including his Master's Degree which was focused in the area of gifted and talented learning. He has a passion for all things athletic and particularly enjoys golf, soccer, volleyball, and hockey. Mr. Robinson's passions can be found in human rights, volunteerism, and travel. In a perfect world, he'd like to do all three at the same time. It comes as no surprise then, that he lead Brentwood's inaugural Service Learning trip to Peru and to grew our relationship with Mosqoy, a non-profit organization that focuses its resources in promoting the success of marginalized indigenous peoples from the Sacred Valley. After moving around Canada and living on several military bases, Robyn and her family settled back in Victoria to embrace coastal living and to be closer to extended family. 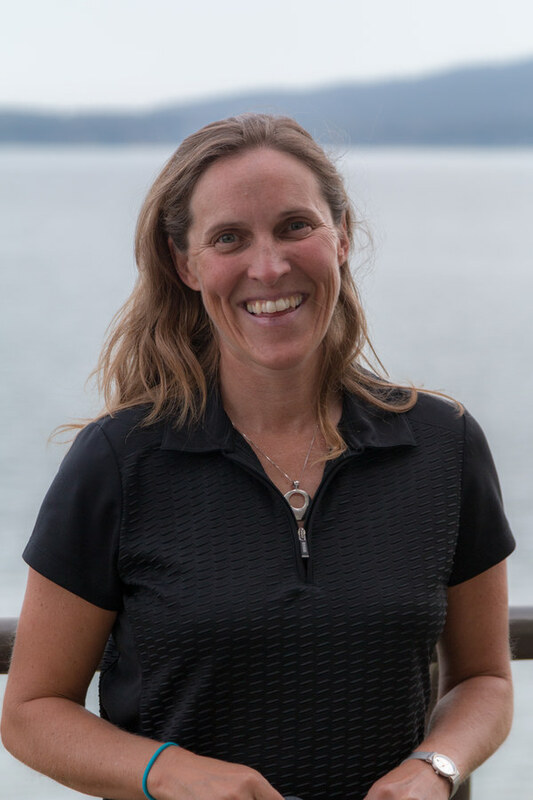 After rowing for the University of Victoria and for various provincial teams, Mrs Amiel graduated with a Bachelor of History and went on to pursue a career in hospitality management. Managing a guest services department at a ski resort proved to be short-lived, as the lure of Brentwood was enticing. After coaching rowing and teaching social studies at the school for three years, Mrs Amiel took a short hiatus to coach collegiate, varsity rowing and complete her Masters of Education degree in curriculum and instruction at Washington State University. Since returning in 2012, Mrs Amiel enjoys coaching the senior boys and for Rowing BC and Rowing Canada at the U21 level during the summer months. She is also excited to be back at Brentwood in the social studies department. She enjoys living in Whittall House with Mr Amiel and their son. Teaching at a school like Brentwood has allowed for a broad population of students to be taught. Neil gets to enjoy instructing solubility a chemistry class, explaining torts in Law 12 class, then heading off talk about logical fallacies in debate class after lunch. Although little in his university bachelor's degree predicted this kind of diversity, he is truly greatful for the chance Brentwood affords him to teach students to look at the world through both molecular, moral, and critically-thought lenses. Occasionally, he also rides a bike for exercise. Born in Bulawayo, Rhodesia, Mr. Carr came to Canada in 1964 with his parents and little brother, Rory. The Carr family moved onto the Brentwood campus in the fall of 1965 where the senior Mr. Carr served as Houseparent for 19 years. After Brentwood, Mr. Carr attended the University of Washington as a rower and fledgling geographer. Graduation from the University of Victoria brought him back to the Cowichan Valley where he taught at Frances Kelsey Secondary School before answering his primal urge to return to Brentwood. A busy member of the Social Studies Department, Mr. Carr is also a coach of the Brentwood College Rowing Club. Mr. Carr's wife, Leslie Reid Carr, teaches Spanish and French at the school and is the houseparent of Allard House. Together they have two children. Doug received his B.A. from the University of Saskatchewan and completed his B.Ed. at the University of Alberta. He has taught all levels of business - from senior economics to entrepreneurship - as well as history, law and English. Having attended and worked at Athol Murray College of Notre Dame, Doug is a boarding school stalwart. Most recently Doug was the Director of Athletics and Head of Humanities at Notre Dame, where is he was also a Houseparent for seven years. Doug is an accomplished rugby coach having run men’s and women’s provincial teams in Saskatchewan, and been an assistant coach of the Canada U17 team..
Born and raised in the Cowichan Valley, Sarah graduated with a Bachelor of Arts (History and Women’s Studies) from the University of Victoria in 2012 followed by her Bachelor of Education from Vancouver Island University in 2013. Sarah started at Brentwood in 2014-2015 as a Residential Faculty Assistant and quickly fell in love with the Brentwood community. In 2015-2016 Sarah joined the faculty full time in the social studies department. Her passion for history and connecting youth to their learning through hands on activities and technology are just a few things she tries to bring to her classroom. In athletics, Sarah will be working with the girls volleyball programme and is excited to help build athletic confidence with our junior teams. An avid philanthropist Sarah is the school's Terry Fox coordinator. She will also be working with students to ensure inter-house events a yearly highlight! Sarah currently lives in Hope House and is excited to get to know all the students and help them fall in love with learning! A native of sunny Kelowna, British Columbia, Steve Cowie graduated with honours from the University of Victoria in 1975, majoring in history and English, then completed his Masters in history in 1976. He has played rugby for the UVic Vikings, Castaways, the Island Crimson Tide, and Cowichan. As the second longest serving member of the Brentwood faculty, Mr. Cowie is a "lifer" seven times over and now teaches the sons and daughters of students he taught in the early years. He has taught history, geography, English, and law, while coaching at every level of rugby, basketball, golf and tennis. He has had the priviledge of coaching the girls rugby team as well as the Island Tsunami U18 girls team. Though Dr. Johnson defined a historian as "a hopeless drudge", Mr. Cowie tries to make history come alive in the classroom with his passion for teaching and his belief that inspiration and encouragement are the greatest motivators. He likes to think this keeps him eternally young at heart. Mr. Cowie and his wife, Sheila, have two sons - David and Nathan. Born in Victoria, where he completed programs at both the Victoria College of Art and the University of Victoria, Mr. Luna has spent the past nine years balancing a love of teaching with pursuits in painting, sculpture and installation work and writing art criticism. He has exhibited and curated installations of painting in connection to poetry, video, sculpture and historical artifacts, in Victoria, Kelowna, Calgary (where he earned an MFA), Edmonton, Portland, San Diego and San Francisco, as well as publishing catalogue essays and criticism in Victoria, Vancouver, Calgary, Winnipeg, Toronto, Los Angeles and Jakarta. He has taught at the Vancouver Island School of Art, the University of Victoria, the University of Lethbridge, the University of Calgary and the Metchosin International Summer School of the Arts, and is delighted to have in Brentwood a captive audience for both art history lectures (featuring liberal amounts of drawing) and studio classes (with impromptu slide shows.) When not teaching, Mr. Luna enjoys his cheerful, exhausting family and menagerie. As the daughter of a headmaster and as a student, coach, teacher and houseparent, Jillian has had the good fortune of being part of eight CAIS school communities in her lifetime. Jillian graduated from Wilfrid Laurier with her B.B.A. Co-op degree and proceeded to investigate the teaching life at Shawnigan Lake School as a junior faculty member. She enjoyed it so much that she returned to Ontario to earn a B.Ed. at Brock University and then taught at Trinity College School in Port Hope, Ontario. Needless to say, she couldn’t shake the West Coast bug, so she and her husband, Jim Ganley, moved back out to the island where Jillian pursued her MBA at UVic and was an assistant coach with the Vikes Women’s Basketball CIS Championship team. Upon receiving her MBA, she spent some time in the e-commerce and consulting industries then switched her main focus to family life and raising three children, Jack, Jensa and Jay, while maintaining a local consulting practice in her spare time. Jillian brings 3 decades of coaching experience (in basketball, rugby, soccer, rowing and volleyball) to the Brentwood athletic program, ranging from the community level through to elite and provincial development programs. Despite her strapping 5’2” frame, as an athlete, she competed at the university level in rugby, rowing and basketball. Now, a little older and a lot more sensible, you can find her on the hardcourt coaching rather than playing – a transition for which her knees and ankles are deeply grateful. After completing her Bachelor of Arts degree at Simon Fraser University, Laura Richardson decided to pursue a family tradition and became a teacher. She completed her B.Ed. at the University of British Columbia in 1991. As teaching jobs were scarce in Vancouver, she headed home to the Fraser Valley where she taught in the Chilliwack School District.Trading the fresh waters of Cultus Lake for the oceanfront of Mill Bay, she and her husband, Dan Norman, both jumped at the opportunity to live and work at Brentwood. The move to the island worked well for her family and after nine years of assistant house parenting in Alex House, Laura moved off-campus in 2010. She continues to spend family time sea kayaking and camping all over the West Coast and recently has taken up gardening as a new passion. As the teacher sponsor of the Brentwood Environmental Action Team, Laura works with her team of students to educate the community about sustainability. Armed with the knowledge and skills to become global stewards, she hopes that when students leave the shores of Mill Bay, they will take better care of their own communities. Liam Sullivan began working at Brentwood College School in 2007, taking a position as an assistant Houseparent in Whittall House. He worked with Mr. Gage for three years while teaching Social Studies and coaching the junior boys’ basketball team, before accepting the role as Houseparent of Ellis House from 2010 to 2018. Mr. Sullivan has been involved in numerous sports throughout his life however, in high school he began to focus on basketball exclusively and was lucky enough to continue his playing at the college level. Mr. Sullivan was the captain of the 1994 National Championship team at Vancouver Island University. Once his playing career ended, Mr. Sullivan has devoted his time to coaching the sport he loves. He has been involved in coaching basketball from the elementary school, middle school, high school and college levels for the last 20 years. Mark Wismer grew up on beautiful Manitoulin Island, the largest freshwater island in the world. It was here in this idyllic setting that he first developed his interest in teaching from his mother, also a teacher. Mr. Wismer graduated with a B.A. in Political Science and Human Geography from McGill University. During his time at McGill, he was introduced to the sport of rowing and joined the varsity team for the last three years of his degree. After graduation, he moved out west to hone his rowing skills on Elk Lake, Victoria, a well-known training ground for the top rowers in the country. It was during this time that Mr. Wismer first joined the Brentwood community, working as an intern. Called back to the East, he returned to Montreal and got married to his wife: current part-time nurse Ulrika Drevniok. Curiously enough, when the couple first met, Mrs. Drevniok was being coached by Brentonian Dave Calder (1996), a silver medal Olympian. While in Montreal he coached rowing at McGill and served as the Head Coach of the rowing club for one year. In 2008, the Wismers moved to Ottawa where he completed his education degree at the University of Ottawa. We were pleased to welcome Mr. Wismer formally to our school in September 2009 where he is Assistant Houseparent in Ellis House and teaching in the Social Studies department when he isn't coaching rowing. He and his wife have also added two wonderful children – Cormac and Stella Maris - to the Brentwood family. Students are introduced to the concept of change and the factors that contributed to the dramatic shifts that occurred in Europe and North America during the period 1500-1815. Specific areas of study include the English Revolution, Industrial Revolution, American Revolution and French Revolution. Themes such as society and culture, politics and law, economy and technology, and the environment are used to analyze the nature of change and develop students’ critical thinking skills. Course content includes examinations of how the expansion of European hegemony significantly altered the political, social and cultural systems of many of the world’s non-European peoples, particularly in Africa, Asia and the Americas. As well as how during a period of scientific change and new technologies (the Industrial Revolution), major challenges to the established systems of thought regarding religion, politics and social structure (the Enlightenment) were to take the form of revolutions in England, America and France, political and social upheavals through which the modern world was beginning to emerge. 21st Century Studies 9 is a fast-paced course divided into four rotations which cover five main topics: Technology and the Problem Solving Process; Introduction to Business and Marketing; Researching Social Issues; Media Literacy and Advertising Awareness; and Executive Functioning. Through simluations, problem and project-based learning, and interactive group projects, students develop their critical and creative thinking skills. This course explores four main themes: economic and technological change, culture and society, politics and law, and the environment in Canada from 1918 to present day. After World War I, Canada participated in significant global events to help redefine the Canadian identity. New political ideologies challenged the old systems and political reform transformed Canadian society. As the country developed greater autonomy away from England, it faced challenges not only in the growing relationship with the United States, but also continued concerns regarding the Government’s relationship with French and Indigenous Canadians. The course also looks at Canada in a foreign affairs context with an emphasis on middle power policies, peacekeeping participation in 21st Century conflicts, and global economic relations. Brentwood College School is excited to present the new BC Social Studies curriculum to our high school students. Up to the Grade 10 level, that journey has started already. We had anticipated that the full implementation of that curriculum would take place in September 2017, but the Ministry of Education called for a delay. Moving forward, our teachers are keen to challenge Brentwood students with components of the new curriculum, and that students entering Grade 11 have already transitioned into elements of the new curriculum already demand that we offer unique options to ensure they are getting the most out of their work in social studies. We are going to facilitate the Social Studies 11 curriculum, but guide students through it in an enriched way. Students will be able to choose from the three options below, assuming their timetables can accommodate their preference. Depending on the students background knowledge, they will be afforded the opportunity to explore specific areas of interest regarding the concepts of nationalism and the breakdown of long-standing imperialist structures created by new economic and political systems. If students have a background in European and Canadian history, they will be encouraged to explore situations from around the world. Students in this class will have the opportunity to explore how our understanding of geographic and environmental factors influence the development of agriculture, trade, religion, values, politics, language and authority in cultures. If students have a background in European and Canadian history, they will be encouraged to explore cultures from around the world. Students will be provided with the opportunity to explore how political decisions are made, the institutions that shape power in different countries, the impact of unequal distribution of political and social power as well as agreements that have been made on an international level that represent comprises between countries with different values. If students have a background in European and Canadian political developments, they will be encouraged to explore political developments around the world. This course will examine the many complex and fascinating issues that affect our global community. Students will study the various concepts and perspectives through individual and group research and in-depth class discussions. Topics include globalization, human rights, trade, development, foreign aid, gender issues, terrorism, and international organizations. These concepts are examined in their historical contexts and through the analysis of current events. Students use several case studies from different countries, concentrating on the relationship between the developed and developing world. The focus of the coursework is to help students gain an appreciation of the interdependence of these topics and so develop a greater ability to interpret and understand global events. The study of art and its role in society from prehistoric times to the renaissance forms the basis of this program. Students examine and critically analyze major forms of artistic expression from the past and the present from a variety of cultures. While visual analysis is a fundamental tool of the art historian, art history emphasizes understanding how and why works of art function in context, considering such issues as patronage, gender, and the functions and effects of works of art. This course is a broad-ranging discussion and research based study of issues that arise from the development of technologies. Students adopt an ethical perspective. They are encouraged to challenge and debate accepted positions in areas such as biomedical and computer technology. The nature of ethics and value systems are analyzed as well as the premises behind scientific thought. Pseudoscience, logical fallacies and the relationship between science and the media are also discussed and illustrated through a variety of case studies. In this course students explore all aspects of the judicial process. In addition to studying particular cases, students will research and present legal arguments in a debate format simulating a mock-environment. The Foundations of Law, including the Charter of Rights and Freedoms, plus family, civil and criminal law form the main elements of the course. This course is a detailed examination of our physical environment, including geomorphology, climatology, meteorology, soils, and natural vegetation. Human geography includes a study of energy resources, minerals, alternative energy sources, agriculture, transport and communications, industry, and land use choices. Project-based learning and map and photo interpretation also constitutes a significant part of the course content. This course follows the BC provincial curriculum that covers the majority of the 20th Century and the incredible political, social and technological changes that marked the period from 1919 to 1991. Students will examine the significant global impacts in the aftermath of World War I, the inter-war period, the causes, course and results of World War II, the post-1945 world to 1991, and the deterioration and ultimate collapse of communism in the West. In addition to political events, social and economic issues, such as the changing role of women and the impact of technology, are explored. AP Art History is designed to provide the same benefits as an introductory college course in art history: an understanding and enjoyment of architecture, sculpture, painting and other art forms within historical and cultural contexts. In the course, students examine major forms of artistic expression from the past and present and from a variety of cultures. They learn to look at works of art critically, with intelligence and sensitivity, and to articulate what they see or experience. Students examine the following spectrum: non-European artistic traditions, ancient through Medieval, and Renaissance to present. Course content spans a broad spectrum: ancient through Medieval including pre-history, the Ancient Near East, Egypt, Greece and Rome, early Christian, Islamic, Byzantine, early Medieval, Romanesque and Gothic. The course also examines the Renaissance to present including 14th through 16th centuries, 17th and 18th centuries, 19th century and 20th century. In May, students write the Art History Advanced Placement exam. This rigorous course covers an introduction to comparative politics, sovereignty, authority and power; political institutions; citizens, society and the state; political and economic change and public policy. Six countries form the core of the AP exam: China, Great Britain, Iran, Mexico, Nigeria and Russia. Students are encouraged to analyze and critique political systems and their historical records as well as gain an appreciation of media influences and cultural bias. The political spectrum in all its hues and the machinery of government form a backdrop for discussions on current world events and future trends. Students are encouraged to take Political Studies 12 in preparation for this advanced placement course. This course is primarily for students who have demonstrated a high level of ability in 2D art and who may be interested in a post-secondary career in a related field such as art, photography, fashion or design. The course promotes a sustained investigation of all three aspects of portfolio development—Quality, Concentration, and Breadth. It enables students to develop mastery in concept, composition, and execution of drawing and 2-D design. In addition, students develop a variety of approaches in drawing and design and are able to demonstrate a range of abilities and techniques, solving problems and expanding ideas using different media. Students also study painting and drawing styles from the past and learn to incorporate elements of these into their own work. The course emphasizes making art as an ongoing process that involves the student in informed and critical decision making. This includes group and individual student critiques and instructional conversations with the teacher, enabling students to learn to analyze and discuss their own artworks and those of their peers. The course provides a systematic study of human geography, including a look at the nature of population, cultural patterns and processes, the political organization of space, agricultural and rural land use. Industrialization and economic development within cities and urban land use are also explored. The course teaches the use of spatial concepts and landscape analysis to examine human organization of space. Software programs that integrate data sets with maps of various kinds are employed to help students image and display patterns of human interactions and changes in resources. An appreciation of how to use and interpret data sets and geographic models is a major outcome of the course including aerial and satellite imagery on scales that range from the local to global. The geography of religion, ethnicity and language are explored from a cultural and historical perspective together with man’s impact on the planet and its ecosystems. The challenges posed by population pressures and economic development are considered from a global perspective as well as through case studies that illustrate particular relationships and principles. Critical thinking and the ability to extract meaning from data are key skills that are developed throughout the course. Students are encouraged to take either Global Studies 11 or Comparative Cultures 12 in preparation for this advanced placement course. The study of European history since 1450 introduces students to cultural, economic, political, and social developments that played a fundamental role in shaping the world in which they live. Without this knowledge, we would lack the context for understanding the development of contemporary institutions, the role of continuity and change in present-day society and politics, and the evolution of current forms of artistic expression and intellectual discourse. In addition to providing a basic narrative of events and movements, the goals of AP European History are to develop (a) an understanding of some of the principal themes in modern European history, (b) an ability to analyze historical evidence and historical interpretation, and (c) an ability to express historical understanding in writing. AP World History focuses on developing students’ abilities to think conceptually about world history from approximately 8,000 BCE to the present and apply historical thinking skills. Five themes of equal importance — focusing on the environment, cultures, state-building, economic systems, and social structures — provide areas of historical inquiry for investigation across different periods and regions. AP World History encompasses the history of the five major geographical regions of the globe: Africa, the Americas, Asia, Europe, and Oceania, with special focus on historical developments and processes that cross multiple regions. Psychologists are interested in every aspect of human thought and behaviour. This focus explains why there are more than a dozen sub-fields of contemporary psychology. Psychology 12 AP introduces students to the systematic and scientific study of various topics: History and Approaches, Research Methods, Memory, Biological Bases of Behaviour, Sensation and Perception, States of Consciousness, Learning, Thinking and Language, Motivation and Emotion, Developmental Psychology, Personality, Testing and Individual Differences, Abnormal Psychology, Treatment of Psychological Disorders, and Social Psychology. As students investigate normal and abnormal perceptions, thoughts, feelings, and actions through textbook readings, demonstrations and labs, they will learn and employ the scientific methods used by psychologists as well as work to meet the AP College Board outcomes for this quick paced course. They will learn to think with a psychological lens—with curiosity, skepticism, and humility. Students will expand their understanding of themselves and the people around them. Whether they choose to pursue a career in psychology or in some entirely different field, this course should enable students to recognize psychological principles encountered in everyday situations, and to apply the concepts to explore their own lives. This course is designed to prepare students for the rigours of academic work at the university level. Through reading and analyzing documents, articles, and texts, students will develop research and writing skills in a diverse range of topics. Much of the content of the course is student driven and the curriculum is focused on skills that will be developed throughout the year. Students are encouraged to take AP Seminar 11 in preparation for AP Research 12. In AP Research 12, students further their skills acquired in AP Seminar 11 by understanding research methodology; employing ethical research practices; and accessing, analyzing, and synthesizing information as they address a research question. Students explore their skill development, document their processes, and curate the artifacts of the development of their scholarly work in a portfolio. The course culminates in an academic paper of 4000-5000 words and a presentation with an oral defense.